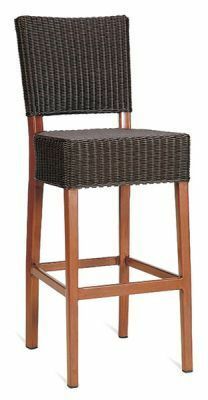 Outdoor high stools with a teak frame and Espresso weave design. Suitable for outdoor use and delivered in 2-3 days from order. Comes assembled and read to use. Wooden imitation rattan bar stools held in stock and suitable for outdoor use in a range of different high end outdoor areas. Held in stock for a quick 2-3 working day turn around.